Flora is a local floral design company. Forage is a coffee house inside of this lovely flower shop. I worked with the lovely ladies of flora & forage to create a new website in 2018. I designed a the new site for Flora & Forage in square space after designing them a wordpress site a few years ago. They provided almost all of the photography. We worked together on text. The wonderful ladies Flora needed a site that could be edited often and had space for lots of amazing photography. They needed a calendar feature so they can promote the many classes and music events happening at flora. The menu for Forage needed to be online too. The website really shows off what a lovely experience Flora & Forage are. The core idea behind small measure is that making environmentally lifestyle choices simple daily gestures that individuals can take to benefit themselves, their families, their communities, and the planet. project :logo, brand & website makeover, rebrand, from the original site, I helped Ashley create 2008. we changed the site from wordpress to square space. It’s a theme this year! 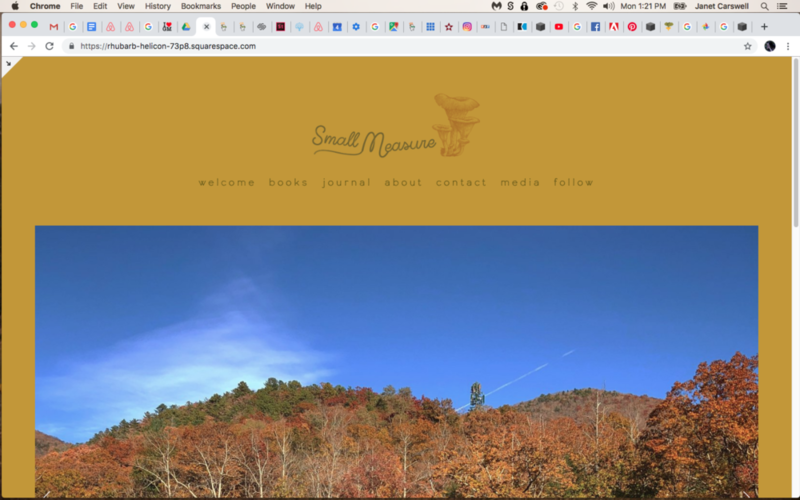 I created a new site for Ashley English, the lady behind small measure in square space. Ashley needed a site that could feature her 11 (almost 12) books and counting…, and could be upgraded in future to feature a store, and online classes, and other things too. We worked together on pulling photography from Ashley social accounts (& her hubs Glenn’s) to find what we needed, and Ashley wrote most of the rest of the copy for the site. The site feels like going to Glenn and Ashley’s house. Comfortable, stylish, interesting, and a lovely experience. Johnny’s Got Worms : project: logo, brand & website design. Johnny really does have worms. Lots of them. They help him by creating worm Poop. It’s like magic for helping things to grow, and you make it from things that were alive, like food straps and compost greenery. Johnny is a super fun guy and is so passionate about his journey to save the planet using worms. Who knew worms were so awesome. I worked with the Ananda team to create their new website in square space. I used their existing logo. For clarity I did not change their logo or brand in any way, I just stepped in and made it work for 2019. This was a project filled with creative people. The folks over at Ananda needed a site that could direct their clients to one of two salons to book appointments. The video on the home page not only looks nice, it creates better google ratings than not having a video on the homepage. The black and white feel of the site works so well. And of course the best part of this project is that everybody’s hair is always looking amazing.